I didn’t hide the fact that I was a bit disappointed with the first Rocky film. It won Best Picture, but I wasn’t terribly impressed. I wanted goosebumps, but didn’t really get any as the film climaxed. So needless to say, I was far from thrilled about facing SIX MORE installments of this thing. But I figured, datedness–which plagued the introductory chapter so much–will eventually stop being a factor as the movies become newer. And rightly so, Rocky II is better than Rocky I. There’s conflict. There’s struggle. There’s adversity. And everything that happens–every plot point–is well-deserved this time. However, Rocky II isn’t a perfect movie by any means. Much of the first act is disjointed, but sets up everything that follows well. Picking up right where we leave off in the first film, Rocky is fresh off his fight with Apollo Creed. And although Apollo technically won by decision, the champ is facing scrutiny from the public saying the fight was rigged or that he shouldn’t have won. Rocky, on the other hand, has moved on. Or at least it seems that way. He and Adrian get married and start their lives together. But Creed is taunting Rocky to get back into the ring again for a rematch. Not that Rocky wasn’t already an affable character, but here, we learn more about him, which makes him even more likable. In this one, the themes are also much more interesting. Much of this film is about Rocky becoming famous and recognizable–automatically bringing more meaning to the first film–but then also shows how easily the public forgets about him and what he accomplished. One of the great scenes is when he tries to read the lines for a commercial he’s doing, but can’t get any of them correct. Stallone just plays dumb so well. Unlike the first, Rocky actually has his back up against the wall. He’s being laughed at by his peers, and his relationship with Adrian actually has some issues. It’s nowhere near as easy this time around for Rocky. And by now, we know the characters well enough to appreciate it all. After watching this one, I finally got goosebumps–along with a few tears. As far as ’70s movies go, this one isn’t as dated as it may appear to the untrained eye. The visuals are pretty realistic, the camerawork is comparable to today’s cinematography, and you seem to forget that it was made over 30 years ago. Max (Mel Gibson) is a law enforcer in a dystopian future who engages in a war with a motorcycle gang as each party is trying to avenge the tragedies within their own group. The acting’s great too. Gibson humanizes the hero and gives him a natural depth beyond just being a tough guy. 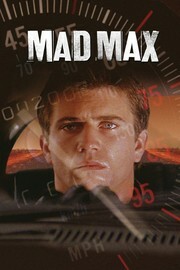 While Mad Max may have been ahead of its time in the technical departments, it doesn’t make up for it’s script issues. It’s not that I dislike this film, but it’s that it annoys me. Mainly due to Max’s wife, Jessie (Joanne Samuel), who keeps wandering off in this world that’s proven to be egregiously dangerous. She gets several outs, but always seems to not use them. The script keeps manipulating her actions in unrealistic ways just to create conflict. And the couple has a son, but they keep leaving him behind in order for the filmmakers to play out this “new love” theme that they want to force into the film so badly. The premise is stretched thin, and the movie also fails to give us enough background in the beginning. It feels like we are playing catchup for the first 45 minutes. The movie is cool to look at, but it falls short of the hype that time has built for it.